Your card will not be charged until this item is available. 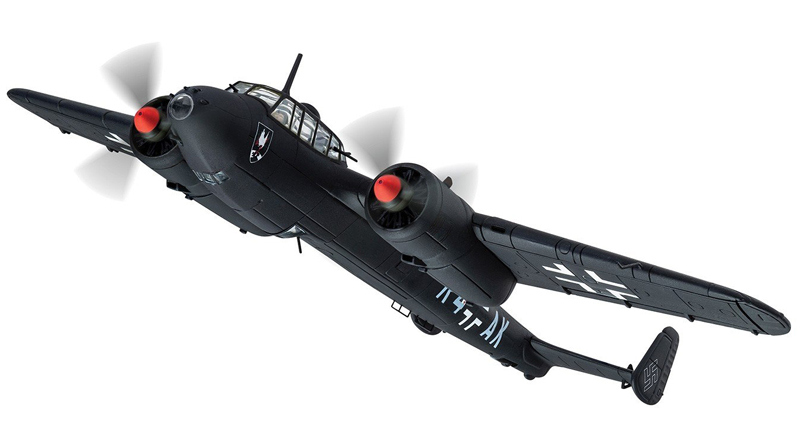 As the most heavily produced version of the Luftwaffe’s distinctive ‘Flying Pencil’, the Dornier Do17Z would see plenty of action during WWII, including several roles for which the aircraft was not initially intended. Almost obsolete by the time of the Battle of Britain, this ungainly looking bomber was also rather surprisingly pressed into service as a heavy night fighter, as the Luftwaffe tried to establish an effective force to repel the growing number of RAF raids targeting German cities. Contesting a deadly game of nocturnal cat and mouse, the aircraft of l/NJG.2 represented a specialist unit mounting long range night intruder missions over Britain, aiming to disrupt Bomber Command operations a little closer to their home bases, attacking bombers returning from their latest raid as they prepared to land. This sinister looking Do17Z-10 Kauz (Screech Owl) had been modified specifically for the task and was equipped with a nose mounted infra-red searchlight and detection system, along with a devastating array of weaponry designed to make short work of any British bomber it detected. Operating from the captured Dutch airfield at Gilze-Rijen, R4+AK was the mount of future night fighter ace Erich Jung, who ended the war with 28 nocturnal victories.